There are two things that seem to be all the rage in the world of writing and software: (1) Markdown and (2) “distraction-free” writing environments. I’m more interested in the latter than in the former—I’m actively trying to root out distractions wherever they may be found. But Markdown is easy, everywhere, and seems a good way to explore learning other, more complex coding languages. Ulysses offers both, and then some, with the goal of eliminating anything that takes the writer away from her or his craft of constructing words, sentences, and stories. In fact, I’ve written and edited this post in Ulysses, then exported it as html into my WordPress blog. Good writers need good tools, so a serious scribe will take time to track down a trustworthy tool, but one does want to be able to just open whatever program and start writing. The Editor is where the magic happens (i.e., you write the stuff). Using keyboard shortcuts or the menu bar, you can have one, two, or three panes visible. If you’re really hunkering down, you might not need to see your Sheet List, so can go to the Editor Only view. However many panes you want to see at once (and Ulysses also allows multiple Windows open at once), starting to write in Ulysses is easy. But what about importing text you’ve already got somewhere else? So you can get writing right away in Ulysses, either from scratch or from pre-existing projects in (some) other formats. That’s a plus. Writing in Ulysses itself has been a very positive—even a focusing and relaxing—experience. More on that in the next post. Ulysses as a writing environment requires some effort to learn. For example, there’s the terminology (Sheets, Groups, Filters), though that’s pretty easy to pick up right away. And there’s the three-pane layout—though Mac Mail and other apps have prepped users for that. There’s also the lack of tie-in to the Mac Finder and files with file names. That has taken some getting used to, but it’s not cumbersome by any means. In fact, Ulysses’s powerful search option (⌘-O) has meant I can always find anything I am looking for—quickly. They’re like help files, only more fun and experiential. Note also the fourth pane at far right, where I have added some Keywords (“I read this”—I have used that as a label to track my progress through the help Sheets) as well as a Note. Via this Attachments Bar you can also add an image or set a word count writing goal for yourself. 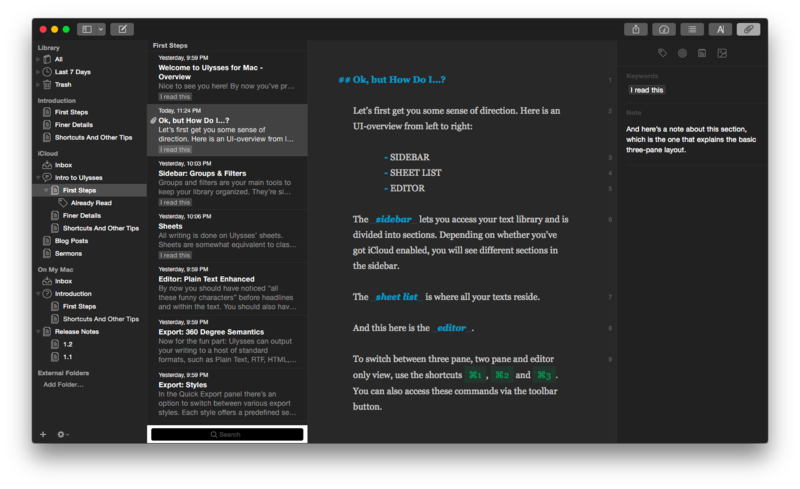 Did I mention how easy on the eyes the Dark Theme/Dark Mode option is for nighttime writing? There are many more features listed here. The few things that at first seemed like limitations in Ulysses were, in fact, easy to pull off by selecting the right menu item. I haven’t been able to find anything like navigation arrows in the toolbar—having these readily visible would easily allow one to move between Sheets and search results without having to have two app windows open at once, but there may be a solution I just haven’t found yet. So far, though Ulysses has required some adjustment to my workflow, I’ve really been enjoying writing in it. My Ulysses Statistics are telling me this post has exceeded 900 words, so I’ll write more next time about (3) Getting Text Out of Ulysses (i.e., export functions) and (4) Ulysses as a Writing Experience. 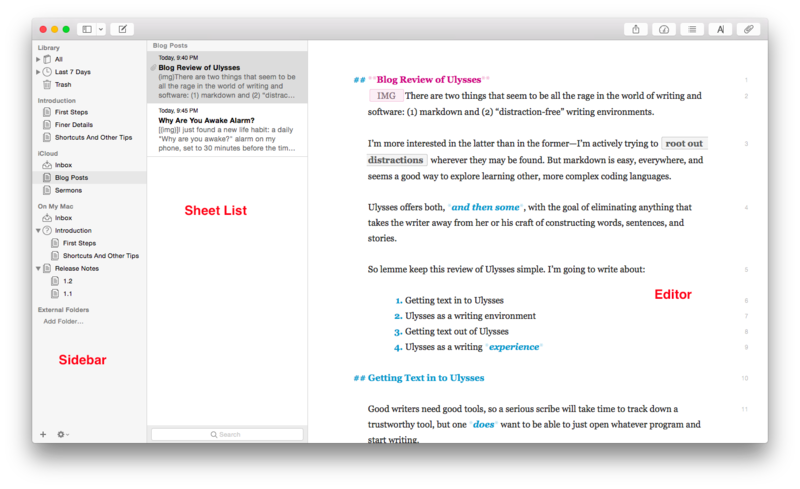 Thanks to The Soulmen Gbr, developers of Ulysses, for giving me a download for the review. See my other AppTastic Tuesday reviews here. Abram, could you comment on the relative advantages and disadvantages between Ulysses and Scrivener? I’ve used Scrivener more than Ulysses (and will be posting soon on a “distraction-free” feature Scrivener itself has), so I don’t know whether I can fully do Ulysses justice yet in my analysis… but the short answer is that for just plain writing–lots of text for long periods of time–Ulysses really is beautifully designed. And that Dark Mode is great for those nights we snooze our “Why Are You Awake?” alarms to keep pounding out text. But Scrivener can do much more by way of being an organizing ground–drag and drop pdfs and all kinds of files. I can’t see Ulysses replacing the sermon-writing or paper-writing process for me, but I can see wanting to use it for composing or editing a final draft.